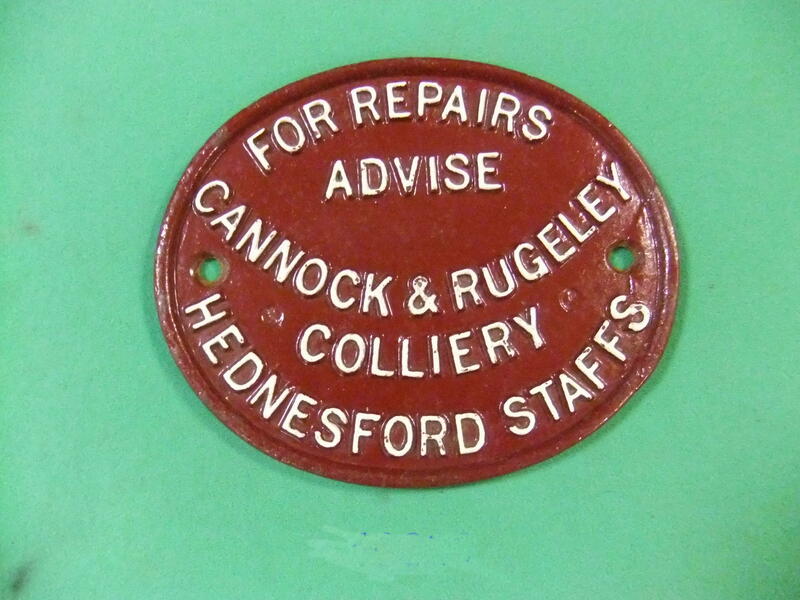 This Cannock & Rugeley Colliery wagion plate is not the most common item ever seen in the museum – in fact, no-one we have asked has ever seen one! This obviously makes it a bit special. Unfortunately, it has a crack (repaired) through the right-hand bolt hole – I wonder how that happened?! 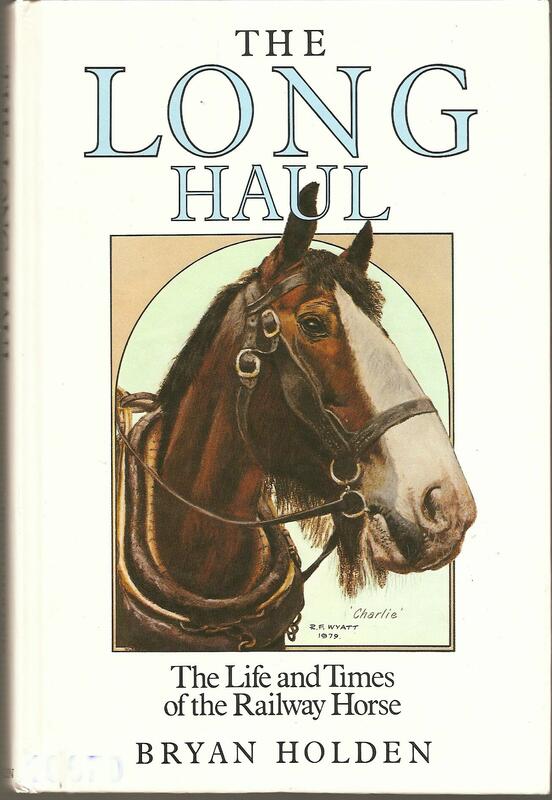 This next item, a book for the library, has come along at a good time – as we have recently seen the return of the horse-drawn parcels van. It should be pointed out that the horses in this book used to pull carts, vans, etc. 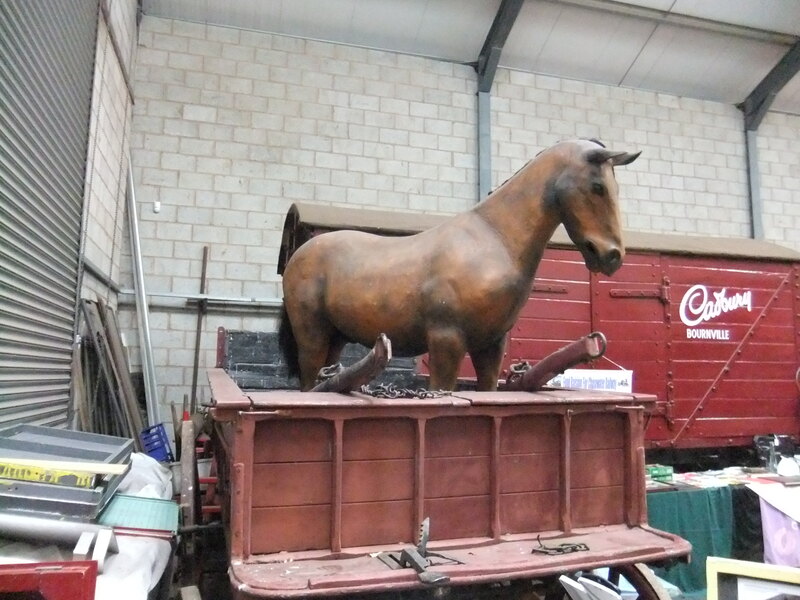 unlike the Chasewater Railway Museum version, which seems to prefer to ride in them! 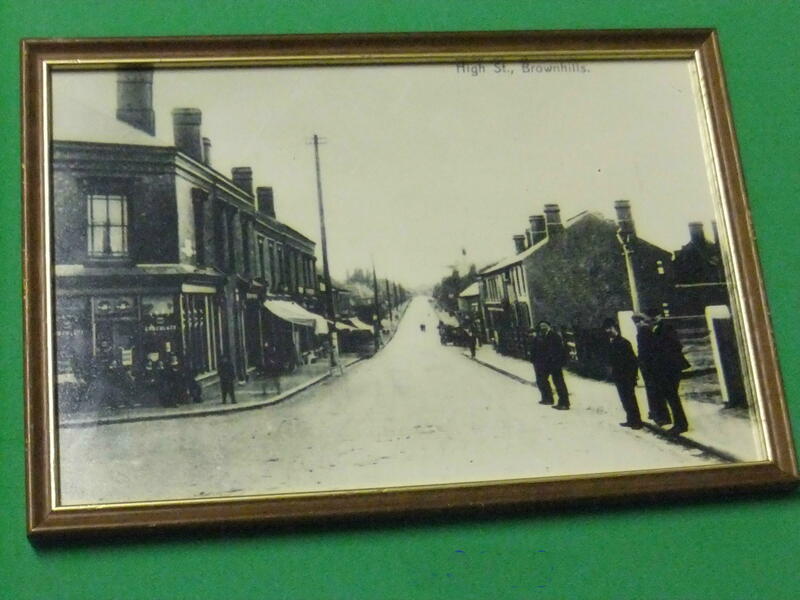 The final item was a raffle prize at the recent Gerald Reece talk about Brownhills, and shows Brownhills High Street in the early 1900s, won by one of the museum staff. If you’ve seen the photo on Brownhills Bob’s site, the bald headed bloke on the back row, right-hand side! The Chasewater Railway Museum has received a significant donation from Dr.P.Fuller in memory of her late father, Mr. Anthony William Eele Fuller. This donation comprised approximately 100 books, 50 DVDs, 30 videos, 5 pictures and a Hornby GWR Mixed Traffic train set. The photograph shows some of the museum staff perusing a small part of the collection, some of which will add to the museum’s collection of books and DVDs while others will be sold to add to the museum’s funds for future purchases of railway artefacts. The model railway has already been sold to a member of the railway, making a significant contribution to funds. 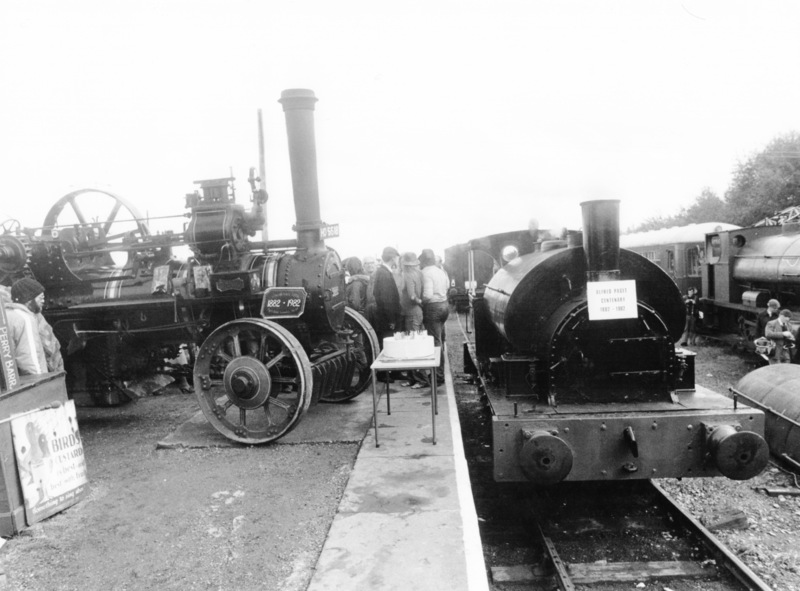 The Chasewater Railway Museum sends Dr. Fuller sincere condolences on her loss and many thanks for the donation, which will be put to good use. Just a few samples which are of local interest the the Chasewater Railway. On behalf of the Bodmin & Wenford Railway Trust we overhauled the boiler of 1916-built GWR 2-8-0 tank 4247 (owned by 4247 Ltd), which needed a complete new steel backhead along with other significant work: the work also involved a lot more than just the boiler. It took just over a year and 4700 hours, 60% on the boiler. 4247 returned to Bodmin in November 2011. The Great Western Railway (GWR) 4200 Class is a class of 2-8-0T steam locomotives. They were designed for short-haul coal trips from coal mines to ports in South Wales, working 1000+ ton coal trains through the Welsh valleys. The locomotives were built with large boilers and narrow side tanks; these engines would pass numerous water stops along their routes so the limited tank capacity was not a constraint. Because of the class’s heavy water consumption and limited tank capacity they were nicknamed “Water Carts”. Many of the lines in South Wales had sharp curves. To traverse these curves, the locomotives were constructed with side play in the trailing driving wheels and coupling rods with spherical joints to allow for movement in any direction. The later 5205 Class were very similar. 105 4200s were build between 1910 and 1923. Fourteen of these were rebuilt between 1937 and 1939 as 2-8-2T of the 7200 Class. In later years many of the remainder were upgraded to 5205 specification with outside steam pipes, larger cylinders and in some cases curved frames at the front end. The first one is a photograph of the ‘Works Siding’ notice in situ in the old Brownhills West yard. Also in the photo is the Manchester, Sheffield & Lincoln carriage, looking quite smart considering it was kept outside in those days. Now the notice is standing on the hand-pump truck outside the museum. The other photograph is of Much Wenlock station. This one comes from a selection of paperwork and photographs from David Ives – a long-time Board member. On the reverse of the photo are two Newspaper articles in small, very neat hand-writing, which I have reproduced here. During the railway mania the heart of Dr. Brookes was stirred to the very depths. He saw lines after lines projected and schemes of railways propounded in all sorts of directions, some merely speculative, others ‘bona fide’, and he wooed in vain the great companies to look in the direction of Wenlock, but the most reckless stood aghast at the steep gradients and the abrupt curves to be encountered in climbing the hill; besides, several companies gave the project the greatest opposition. Ultimately, mainly through the unwearied exertions of Mr. Blakaway, the Town Clerk, aided and seconded by Dr. Brookes and his brother, Dr. Q.G.Brookes, who became Chairman of the Company, and continued so till his death, these efforts were crowned with success, and the hitherto isolated town of Much Wenlock found itself in communication with the productive district of Corvedale and Ludlow on one side, and Coalbrookdale, Wellington and Birmingham on the other. The line is 16 miles in length, the gradients, the greatest of which is from 1 in 40 to 1 in 45, are not so great at this time of day as to frighten anybody. If anyone travelling that way is struck with the beauty of Wenlock station, its rocky pile on the Abbey side, studied with flowers, rare plants and shrubs, asks, as many do, who was the author of so much beauty, he is told – Dr. Brookes. Engine No. 4406 is not the most glamorous of railway locomotives and there was nothing spectacular about the two coaches which it pulled from Wellington to Craven Arms and back again on Saturdays. The majority of passengers from Wellington alighted at Much Wenlock, and on the return journey only one ticket was issued at the booking office at Craven Arms. Yet this was one occasion when the rather elderly engine and the empty carriages could have been fêted along the 14 miles between Craven Arms and Much Wenlock, for it was the last journey to be made along this line, which was opened in 1867. But in its demise the Craven Arms to Much Wenlock line aroused as little interest as it had attracted custom these latter years – and that lack of custom is the reason for its closure. The one ticket issued at Craven Arms was for Mr. J.F.Anstey, the District Commercial Superintendent, who was there to give official recognition to the last journey. There was another railwayman or two, one or two returning passengers and a party of railway enthusiasts from Birmingham and District – for Birmingham took a greater interest in the closing of the line than did Shropshire. 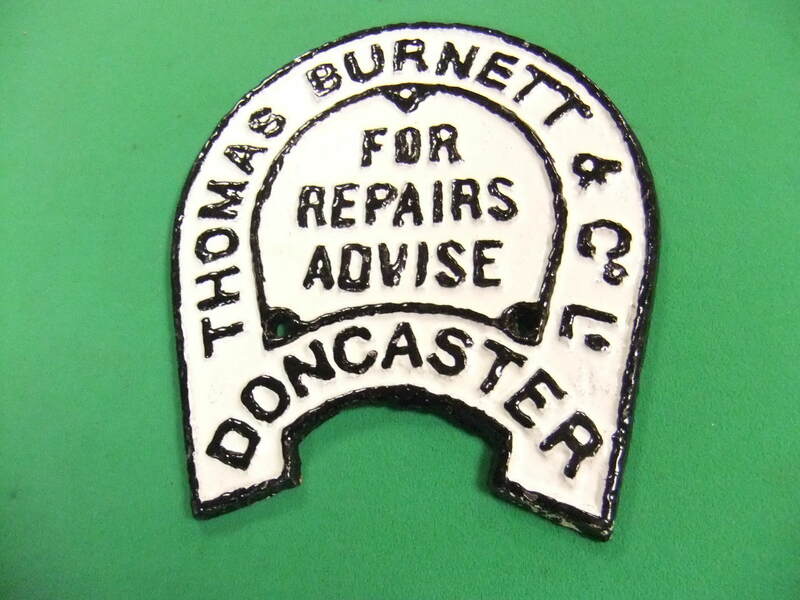 The latest wagon plate to be put on display in ChasewaterRailwayMuseum is an example of one of the horseshoe-shaped variety of the Thomas Burnett & Co. Ltd., Doncaster. The horseshoe shape was chosen by Burnett’s to reflect the importance of their base in Doncaster to the British horse racing scene. Burnett’s were a well respected firm of wagon repairers with several repair depots. In 1951 the Company merged into Wagon Repairs Ltd. and the name ‘Burnett’ vanished. 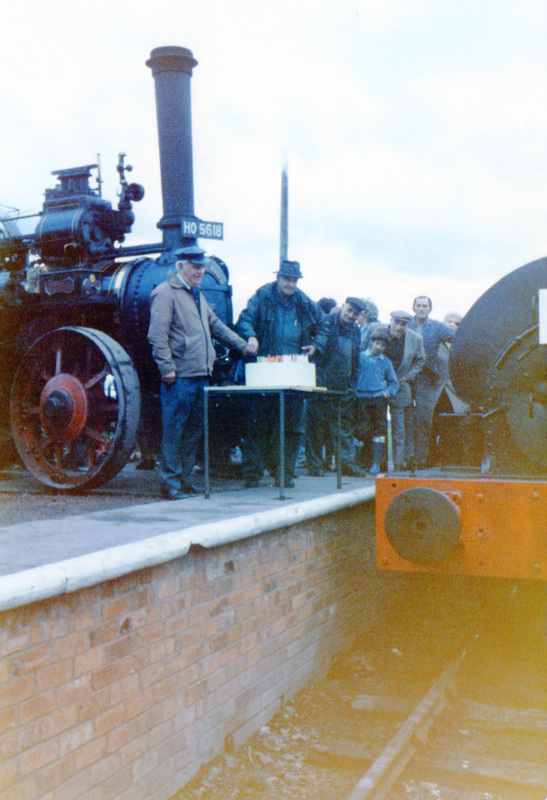 The Chasewater Railway Museum has a significant amount of paperwork formerly belonging to David Ives, a founder member of the Railway Preservation Society and a long-time Board Member of the Chasewater Railway. Our curator is working his way through this paperwork to put it in some sort of order, and is finding some interesting photographs in some of the boxes, including the ones shown here. The centenarians involved are the traction engine ‘Little Wonder’ and the Neilson steam locomotive known as ‘Alfred Paget’ (2937/1882). 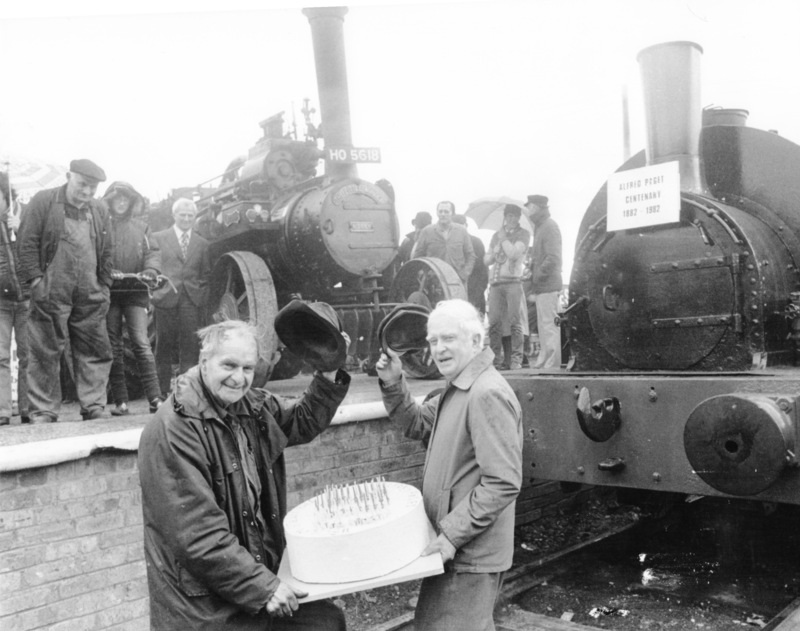 The gentlemen in the photo holding the cake are the late Johnny Mayes, at the time the owner of ‘Little Wonder’, and the late David Ives of Chasewater Railway, on the right.